Neither the Arctic Circle nor the middle of a town sound like the first choice for building an enormous data center, but that’s the kind of location a company called Kolos found in the Norwegian town of Ballangen, a former mining community. The team envisions its future campus there to eventually reach 1 Gigawatt in capacity; if that vision comes to fruition, Kolos will be the operator of the world’s largest data center. We spoke to Kolos co-CEOs Mark Robinson and Håvard Lillebo about the project, its design, and the modular approach the company is taking to fit a large data center into this unusual site. While unusual, it has most of the key characteristics of a suitable data center location, and the company is planning to use innovative design to work around its shortcomings. Low energy rates should make the facility attractive to companies with compute-intensive loads. “Processing energy demands can be interesting,” says Lillebo. Connectivity isn’t an issue, either, as rail links to Sweden have provided a route over the mountains for significant amounts of fiber. Lillebo notes that Ballangen will have access to seven different dark-fiber routes with a 32ms-to-34ms connection to the main European peering points in Amsterdam. That should suit the types of customers Kolos is after. “This is mainly a colocation facility, so we’re not targeting the Googles, the Amazons, the Apples,” Lillebo says. “We aim to have the next 990 on the list.” It’s looking for customers beyond Europe too, companies that are looking for substantial compute power for batch jobs, where low cost is more important than low latency. Unlike most large-scale data centers, which tend to be in the middle of nowhere, Kolos’s facility will be a feature of the town. Built on reclaimed land, created with the tailings from a now closed mine in the mountains behind the town (the site was previously used for flood control and as a small airport), the data center will become part of a restoration of the town’s waterfront, blending into buildings and parkland that are being designed by the same architect, chosen because the town liked the plans for the data center so much, according to the company’s execs. That’s because it isn’t the typical big box full of server racks. 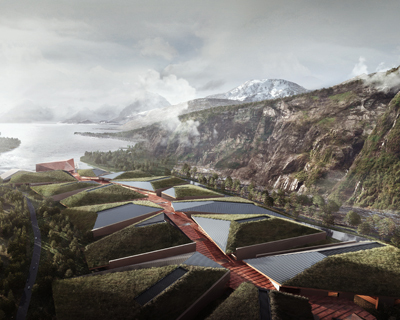 Site renderings show a series of oddly irregular buildings, hugging the long, narrow stretch of land and covered with living roofs for added sound insulation. The first two data centers connect to an administration building that also houses the secure entry and a spine for meeting rooms, equipment, and network operation centers that will be extended as pairs of new data centers are built. Despite being in the middle of the town, site security is also good: there’s water on three sides, a berm down both sides of the lot, and a security perimeter than runs from the corners of the admin building to the edge of the water. Each of the Kolos data centers will be shells that can be constructed in under 11 months; the first customers are due to move in in 2018, and Robinson predicts the first two buildings will be filled in 18 to 20 months, with construction of the next phase starting within six months. This phased buildout means the site can be up and running quickly, without massive capital investment upfront. The data center design is quite flexible. To fit more compute power into the narrow strip of land the equipment is installed in stackable modules built off-site; there’s a built-in set of rails and gantry cranes to move them into place, stacking them four units high, and connecting power, network, and water. The modules will initially be fitted out with standard 19-inch racks, though Kolos can customize pods for individual customers. As designed, each building will have capacity of 30MW, with racks specified for 6.6KW initially, though the DC power modules have extra capacity, and the cooling is rated to 21kW per rack if a client needs a custom high-density rack. The modules have been designed to handle the Norwegian climate, so they’re waterproof, but the climate is actually ideal for a data center. Temperatures in the steep-sided Norwegian fjords around Ballangen rarely rise above 10C, with an average annual temperature of just 3.5C and little variation from day to day, so chilled air is the main coolant for the data center. “We’ll be able to provide a very nice PUE, and you can’t do that in many places in the world,” Lillebo points out, joking that “if we get 14 days above 20C in the summer it’s an awesome summer”. For those two weeks, Kolos will use cold-water runoff used by the same hydroelectric plant that powers the site; it’s meltwater from up high in the mountains, so it’s already cold and needs very little treatment. Despite being at sea level, Ballangen is far enough down the fjord that there’s little fog, so humidity (a key cause of equipment failure) won’t be an issue. The town has lost nearly half its population since the mine closed, but it’s close to a NATO base and a large technical school, which could become a source for qualified staff. The location is also not far from an airfield and larger cities. The combination of cheap power, cool weather, and good connectivity makes countries like Norway and its neighbors ideal locations for data centers. (Ask Facebook, Google, and Apple.) The reason there aren’t more in this area is the lack of suitable sites; with mountains rising almost directly out of the water, there’s very little flat land. Taking full advantage of this reclaimed land in a fjord meant choosing a very different design for the facility, but it could inspire other data center builders to make the same step away from boring warehouses.